“Hegel remarks somewhere that all great world-historic facts and personages appear, so to speak, twice. He forgot to add: the first time as tragedy, the second time as farce.” – Karl Marx, The Eighteenths Brumaire of Louis Napoleon. So reads one of Marx’s most famous quotes. And it is a quote that seems particularly apt today for the Bermuda context. Under the PLP we had the tragedy of, I believe, nine different Ministers of Education over fourteen years; under the OBA we’ve now had three Ministers in two and a half years – and for a year we didn’t even have a dedicated Minister focused solely on education. The tragedy under the PLP was the failure to get a grasp on the problems of education, compounded by a lack of consistency over time with frequent Ministerial changes. The farce of the OBA’s handling of education is no doubt clear to see, with an even greater rate of Ministerial change and inattention to date. 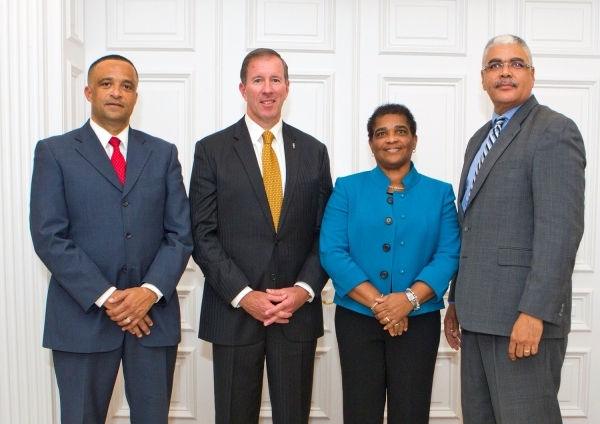 Premier Dunkley pictured with the Ministers following Friday’s [Jan 15] Cabinet shuffle, which saw Mr. Cannonier return to Cabinet as the Minister of Public Works, replacing Patricia Gordon Pamplin who was moved to the Ministry of Community, Culture and Sports; who in turn replaced Wayne Scott who was named the new Minister of Education. Granted, returning the Education portfolio to a dedicated Minister is welcome, however the first few years of the OBA’s tenure leaves a lot to be desired. Under the PLP we had the tragedy of a party forgetting its purpose, its membership failing to adequately hold it accountable and, ultimately, a series of ‘unethical but not illegal’ actions which led to a loss of trust in the integrity of the party as a responsible government – resulting in its electoral defeat in December 2012. Revelations in the then Chairman’s report that, he had ‘discovered in the course of this investigation other matters of equal concern’, but that he was barred from investigating these further, or to pursue investigations into individuals ‘not under the Ministerial Code of Conduct’. To date the OBA has not applied its values of transparency and integrity to shed further light on these revelations. The resignation – possibly under pressure from within the OBA arising from his attempt to practice what the party preached, in applying the principles of transparency and integrity through his investigations into Jet Gate – the OBA’s first Chairman, Thad Hollis. The election of the OBA Senator, Lynne Woolridge, to the position of OBA Chairperson, leading to an inherent conflict of interest in the position – in as much as Senators serve at the Premier’s pleasure, this presents a clear moral hazard affecting the Chair’s ability to fulfil her Chairperson’s role objectively, especially as regards investigating the Premier. The opening of an ongoing police investigation into Jet Gate, of which former Premier Cannonier remains central to. And today we have Mr Cannonier, despite an active police investigation into Jet Gate, including his role in this scandal, rewarded with a key Ministerial position. Even if you believe Mr Cannonier simply acted naively concerning his role in Jet Gate this should raise concerns about the wisdom of appointing him – and so soon – to a Ministry responsible for key capital developments and contracts. And if you believe his actions may have been more than naïve, and perhaps even more than unethical, surely this should have you worried – both about his new position and the judgement of the current Premier. At the very least Mr Cannonier should have remained on the backbenches until the active police investigation into Jet Gate had concluded, provided he was found innocent, and a full report into the scandal made available to the public. The Premier’s actions send the wrong message to his MPs and his members, as well as to the country as a whole. His decision will no doubt also lend itself to questions about whether this appointment was part of a deal between him and the former Premier last May, a deal for the sake of functional unity, putting party before country. The PLP’s time in power was a tragedy – for its members and for our people. The OBA’s time in power is proving a farce. 14 Jan: Opinion: What Does Cuba Mean For Bermuda? You are one hard-to-please bie, Starling. Let’s just have the rest of that quote from Marx shall we? Mr. Starling kinda bends the meaning a bit. Let’s get back to what Marx was really saying, that the meanings of events are reshaped by those who need to deliver a message. There seem to be some other pertinent parallels within this text as well. Very very very good report Mr J Starling !! I give you a ” AAA+ ” !! I JUST HOPE you are not blacklisted for your honesty !!! Thank you for put facts forward !! Do any Ministers make any difference at all….it really is up to the bloated administration of the education system in Bermuda….Ministers are figure heads of the unrealistic political system…. Actually they do. In practice every minister in the last 10 years has directly changed policy and direction through the Permanent Secretaries. Some more overtly and sweeping than others. It is hard to gain any traction when you are constantly changing blueprints, platforms, reviews, policies, laws. Anyone who believes differently is not aware of how difficult it is for civil servants to bring change in education. Almost forgot to add give me farce over tragedy please for a long time…..
How about give us neither… When will people like you hold your Gov’t to account? Or will you simply say ‘farce over tragedy’ so as long as they (the PLP) aren’t in power. You need to take a long hard look in the mirror. You never held the PLP to account…..You still don’t I’ve never heard you criticise Mr Bean for his language and actions or his gambling shop. Now just imagine if Dr. Brown resigned as Premier involving unethical shanangins, saayyy like aahhh JETGATE, and was still under police investigation, then get appointed to a ministerial position, boy the rhetoric that be spewing from the U.B.P/oba’ers. WELCOME TO THE TWO BERMUDA’S. Please Navin.Why not neither farce nor tragedy but honesty, integrity, and competency. Honesty, integrity, and competency can still produce farce and tradgedy. You have written some silly things but I believe this takes the biscuit. It is not possible that honesty, integrity, and competency can produce farce and tragedy within this context as they are mutually exclusive. I forgot in Larry’s world, what Larry says is always right. How silly of me to even question. Jonathan nothing to investigate on jet gate ! no public funds used or misused !so what is it you and the green men keep harping on this? You should more concerned about the fact that you have more fingers than followers ! and further more any drums to be beat should be to demand an investigation on missing funds during the Titanic years of the green men! and their new found wealth while the rest of us drown! Why isn’t he demanding for the investigation into the disappearance of $800 Mill of the publics purse over the PLP 14 years? Really JS? Are you looking for attention? Do you need a hug? What about the part where he called the PLP a ‘tragedy’? Do you agree? Therefore its January 2015, and the next election will be held in December 2017, or during the excitement of the Americas Cup – so in short for PCC helping with functional unity he should be paid properly for the next 36 months. Interesting point by Mr. Starling…whatever happened to that police investigation? If the investigation is complete, why haven’t the findings been made public? If the investigation is on going, why appoint an individual under investigation to Cabinet? More questions that answers, it seems. So Jonathon how would you apply your Marx comment to the three PLP terms, and where was you critic of them ? Where is your outrage at Port Royal , at Marc Beans words and actions? You don’t want to ruin your chances of a job with PLP is it ? The constant them and us, race divisiveness is promulgating an religion of hate and for one purpose and one purpose only. Power. Well see this exactly why anyone who questions the OBA gets a serious side eye from me. The OBA have been a mess at governance but they have been cleaning up since Dunkely became Premier. But I’m not pleased entirely with Craig Cannonier’s appointment to a Ministry however. He’s a good guy for sure but he was a bad Premier. Questioning his appointment is fine because obviously the OBA is the Govt. But where the hell was Starling and all the other OBA critics when the PLP was running rampant!!?? Where?? They had their head in sand hoping and praying that the PLP would make Bermuda the greatest place on Earth. What a laugh some of these ppl are. didnt you play a roll shawn collier and cosmic for building awareness if there was a referendum ? Interesting choice of words. A tragedy has no connotation of real blame….the whole situation was tragic. A farce is a show…something to be pointed at and ridiculed. One major issue with our Ministries.. is the Ministers that are put in place rarely have the right qualifications. This is not limited to a particular party either before anyone chimes in on that. Ministers should have to apply for their positions, not have them handed to them. One Environmental Minister had openly bashed environmentalists on more than one occasion, how in anyone’s mind would this qualify one to hold the position of Environmental Minister. Our Ministers should have qualifications in the respected ministry their are going to be heading. It is assinine that I would have to show my qualifications for a job which pays far less than that of a Minister, yet I may very well be more qualified in the area the ministry pertains to. To have good jobs done, you need people that understand their field (or ministry)!! This is what boggles my brain about our system of Government, people getting handed a ministry yet have no qualifications that pertain to such. Fix that issue and I am willing to bet there would be forward moving progress, regardless of party in power! In Europe and Africa and Asia we have groups and in Bermuda we have Comrade Starling a self proclaimed Communist Marxist Stalanist. Irony is; he pens from a socialist domain. How does that relate to the subject matter? Either the continued shuffling of the Ministry of Education head, or the reappointment of Mr Cannonnier to a Cabinet post? Truth be told!!! Truth is an offense but not a sin!! Carry on Jonathan! AH! Comrade starling we have not heard from you in a long time,as you are a tragdey and a farce. We have many “FREEDOMS”under our present system of which you enjoy. Under Communism we would have “NONE”. Scotland Yard came in to investigate the former PLP government and found nothing; unless some would like to believe; they were brought off by the PLP government? What’s say they come in to investigate the OBA government; I am sure they would have nothing to worry about as I am sure they have decidedly much deeper pockets; international money and all.